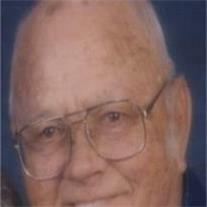 Arthur T. Reynolds age 86, went home to be with the Lord January 27th 2011. He will be missed by his wife of 64 years, Frances Reynolds, daughters, Sheila (Gary) Darst, Teresa (Bruce) Juhl, Debbie Hicks, 8 grandchildren,16 great grandchildren and sister Betty Cogswell. Art worked for The City of Mesa 30 years before retiring to their summer home in Heber, Az. Arthur was born in Talihina, Oklahoma March 16th, 1924 and moved to Arizona in 1941 with his parents and siblings. Services will be Wednesday February 2nd at Bunker’s Garden Chapel, 33 N. Centennial Way, Mesa, AZ. Visitation is at 10:00 AM followed by the Memorial Service at 11:00 AM.